Can I pet your dog? | Go. Do. Be Dog. Why, yes my ears do feel like velvet, sez Yaxley. Yes you may, thank you for asking first. As lovers of all things dog, we puppy raisers do enjoy meeting other appreciators of our furry companions. My heart gets warmly stoked when I encounter toddlers with a seemingly instinctual affection for dogs. With a smile and a squeal, they reach out to grab a fistful of doggie goodness. I absolutely love this. We do come across children with a deep fear of our dogs from time to time. More than just a hesitation to be introduced to something new and different that you might see in a two year old kidlet. I’m talking about the eight year old girl who sees a well-behaved Labrador on a leash and shrinks behind their parent for protection, sometimes accompanied by the trill of a B-movie scream. Whether this fear reaction is nature or nurture, only the family knows. Certainly an early-in-life mishap with a family dog could sour a kid. Or maybe a nasty experience with the pet of a friend. But I’m saddened when I consider that an ugly childhood experience with dog will block the way to all the joys that dogs can bring to life. the way. Chicks, ducklings, goats & more. I’m reminded of this when Yaxley and I are volunteering at the Canine Companions for Independence meet & greet booth last weekend. We’re at the Aullwood Farm Babies Fest and it’s just a glorious day, weather-wise. Yaxley is teamed at the booth with fellow CCI pups in training, TJ and Jorja. They greet their young audience while their puppy raisers educate parents on how CCI works with people with disabilities. Ask first before you pet, the moms say. Hold your hand out so the dog can smell you. Our pups are pros at this thing. Sitting calmly, they will allow all manner of handling by the young folk. Seeing a father encouraging his son to pet Yaxley, it was obvious the little guy was just not sure about this yellow creature larger than he. With Yax in a Down, my pup is now a warm and fuzzy statue of sorts; he is motionless. In this moment, the world melts away as I take on this all important task of showing this gentle kidlet that dogs don’t have to be scary and mysterious things. And Yaxley, the consummate professional in kid comforting, performs his magic. After a few minutes, the yellow pup is receiving full body hugs, the tow headed lad’s face pressed against Yaxley’s belly. And that’s one kid down. But many more are still out there in need of a positive dog experience. Your dog is just beautiful. I want to pet him so bad, but I know he’s working. Thanks, he is a handsome fella, isn’t he? Actually, we’re out today to work on socializing and encouraging calm greetings. You may pet him if you like. 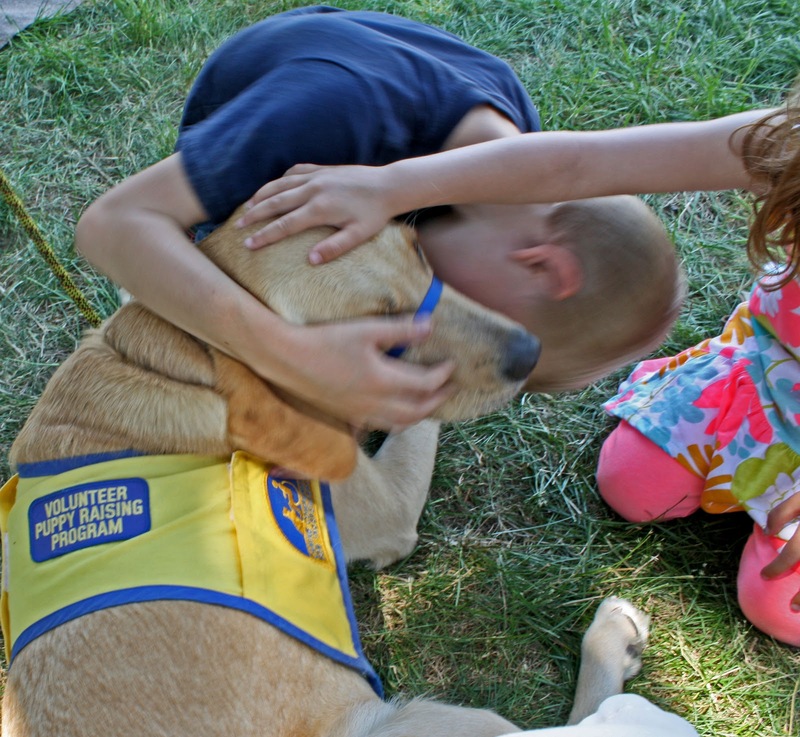 When we give CCI presentations at schools, Service Dog Etiquette is always an important thing to cover with the kids. It’s ok to ask if you can pet the dog, we tell the kids. 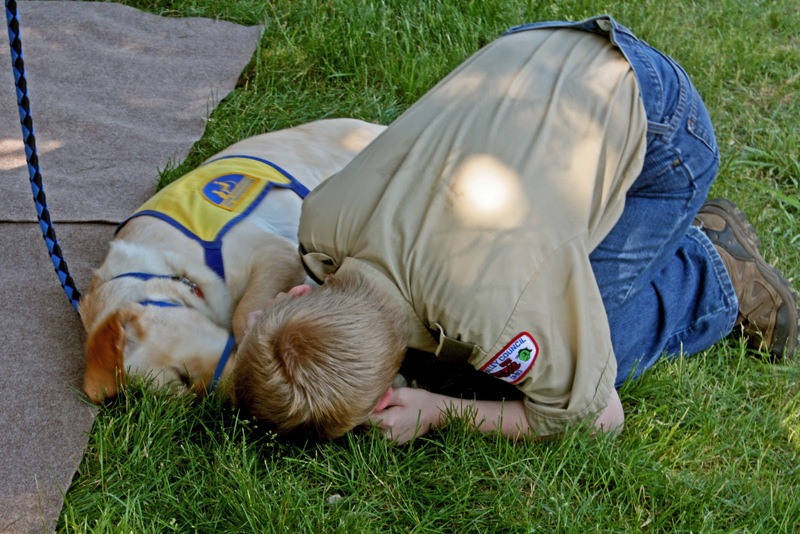 Many people love to talk about their service dogs and what they do. But don’t get your feelings hurt if the person says No. It just means that they need their service dog to be focused right now. It’s not a good time for any distractions to their work. Remember to be polite and say something nice, like OK, have a good day. 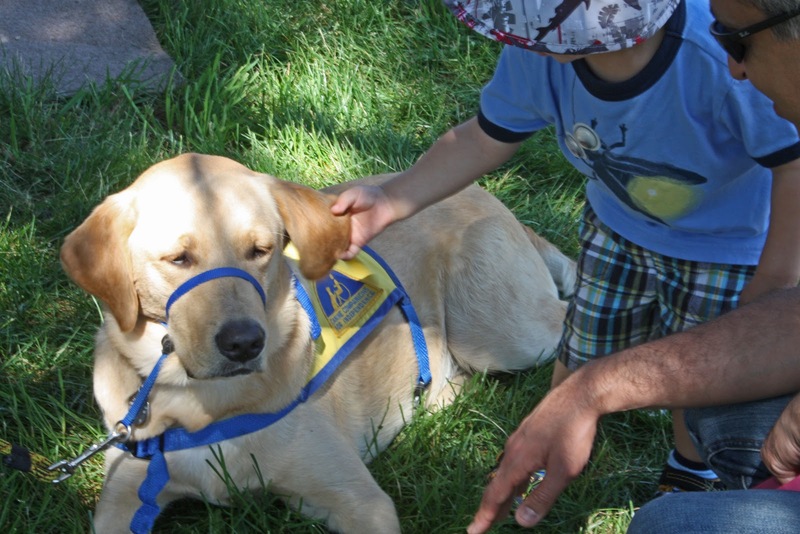 CCI’s website has an informational page on How should people behave around an assistance dog? A good resource for those with questions on can I pet your dog? Not a surprise to see Number One on the bullet point list is Don’t touch the dog without asking permission first. 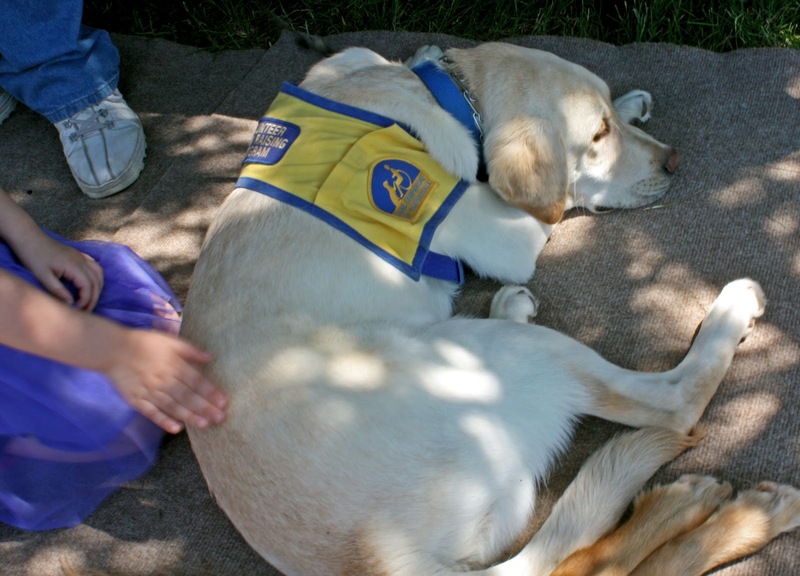 Many assistance dog teams appreciate that their companion is a social bridge. A conversation starter, so to speak, to meet new people. But other times, it’s critical that the dog focus on their handler. So, yeah, always ask first. It’s nothing personal if you get a sorry, not right now. Oh, and this drive-by petting thing, well I gotta say that it’s not the little kids that do it. In my little bubble of experience, I find it’s grown men that will pat the dog’s rump as you pass each other. It’s not that I’m jealous, mind you. But it’s distracting for the dog, fellas. What if someone did that to you? Oh. Well, um, on to the next bullet point then. Never feed the dog. Ah, the power of a dog cookie. Talk about encouraging a dog to lose his train of thought. But we know better about this one anyway, don’t we? Dunno about you, but I would stop mid-conversation if someone waved a frosted brownie in front of my nose. We all have our weaknesses. Speak to the person, not the assistance dog. Hey, eyes up here mister. Again, the distraction factor for the dog, not to mention how ’bout a little respect for a fellow human bean? Don’t whistle or make sounds to the dog. Ugh, why would someone do this? I was in Tim Horton’s tucking into one of their amazing breakfast sandwiches when I hear a low whistle from a couple of tables over. And not for me, the wolf whistle ship has sailed away a decade ago. It’s for my pup in training under the table. Some hayseed and his grizzly buddy are entertaining themselves by trying to distract the pup. Inga, of course, made me proud by being smarter than the two of them. She turns her pretty head and looks out the window. I give the two of them The Look and properly abashed they go back to their coffee. Never make assumptions about the individual’s intelligence, feelings or capability. We’re quick to judge, aren’t we? Sure, I do it too. Like when I refer to some chowderhead as a hayseed. And I’m ashamed when I catch myself. Not all talents are obvious, some disabilities are invisible. These pups are pros at being handled. Jorja gets a dental exam by a boy scout. And CCI’s final bullet point on this topic, Don’t be afraid of the dog. 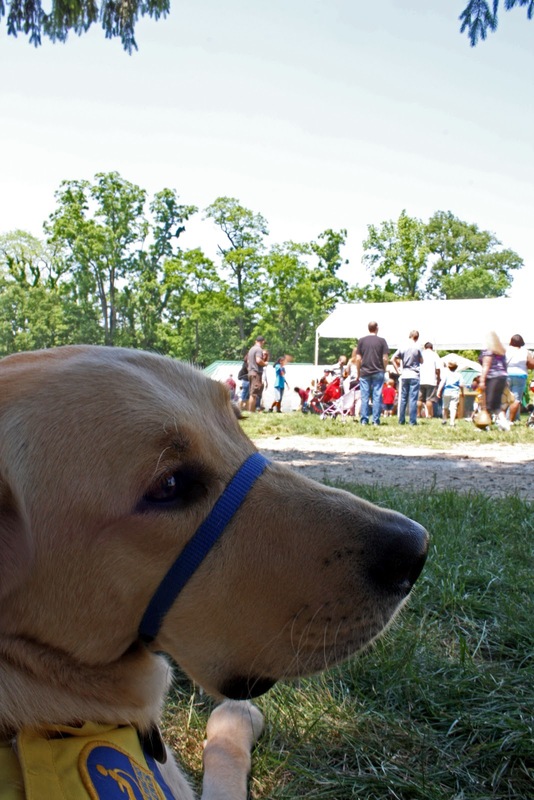 A CCI dog is bred for temperament, carefully tested and selected for appropriate behavior. These dogs are not mere pets with a passing grade in basic obedience. 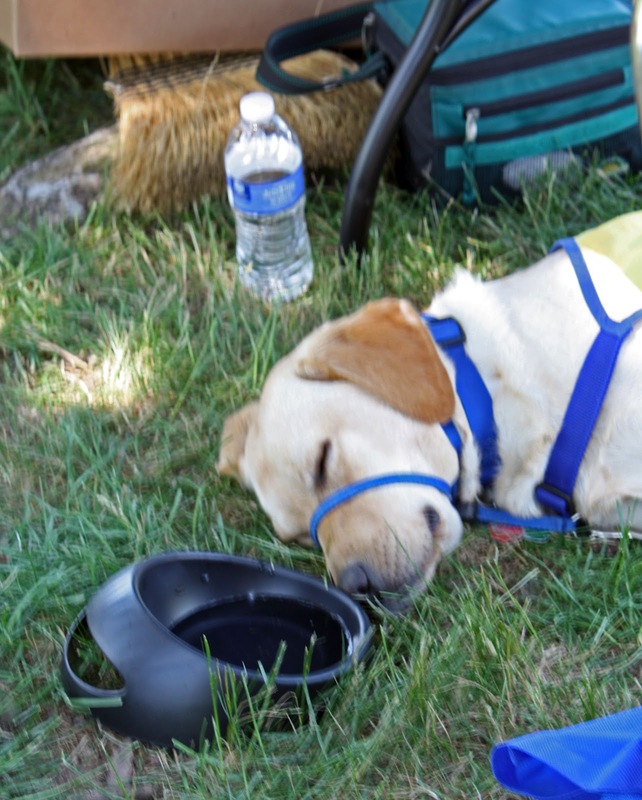 A CCI assistance dog has been socialized by their puppy raiser in different public venues for a been there done that attitude. Then professionally trained at CCI in the ways of an assistance dog. If you see the blue & yellow CCI cape, you’re looking at a well-mannered, confident dog. Guaranteed. When I get the question, will that dog protect you if someone attacks you?, it’s tempting to respond with wanna give it a try and find out? But that would be wrong in so many ways. First, because if the inquirer did rise to the challenge, I’m pretty much screwed. And second, because it’s not becoming to be a smartass when educating people about the pup in training. We do like to keep things on a positive note. from the business end of the pup. If we cook this all down into a reduction sauce, what’s the real message here? Just the basics of civilization, don’t you think? 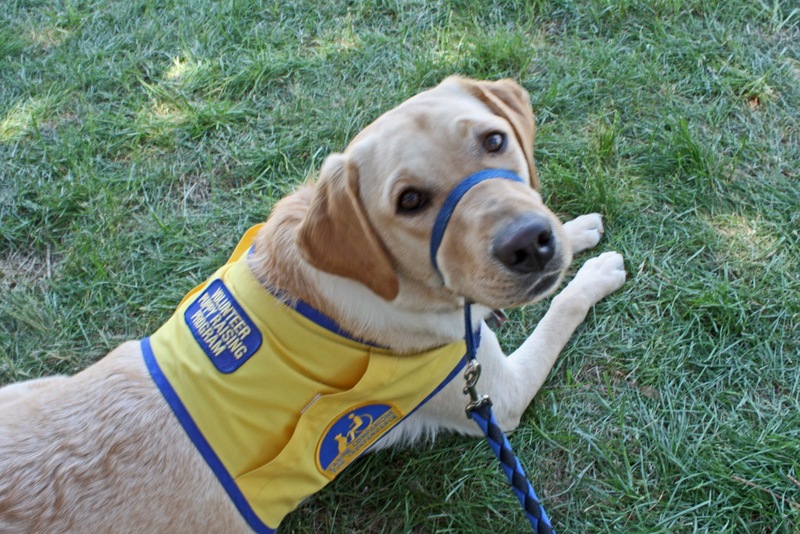 Be polite and respectful of others. .
Be sure to check out CCI’s page where more information on this topic is available at How should people behave around an assistance dog? Jorja catches a power nap before the next shift. It’s not a cat nap, she says. Stop calling it that. Yaxley enjoys a hug. He says boys smell like french fries. Posted in Aullwood, CCI, service dogs, Yaxley. Bookmark the permalink. I love getting that extreme look of happiness when people say “…I know he's working” and then I let them know that we're working on socializing and greeting people politely. I'm not sure who's happier about it the person or the dog! Oh, absolutely! I love it when I can allow a meet and greet. It's hard to say no, especially with kids, but there are times when the pup needs to get comfortable with the sensory overload of a new place. Most people seem to understand, which is helpful. Very cool post – you share the rules in such a pleasant and logical way! Thanks, Pup Fan! I've learned quite a bit in the puppy raising gig. For example, it didn't occur to me (but should have) that it's impolite to touch or lean on someone's wheelchair. It's considered part of their personal space, an extension of their body. That had to be explained to me.